Hi everyone, and greetings from Edmonton, Alberta, Canada! Brett here, A.K.A. NaturalBornQuilter. 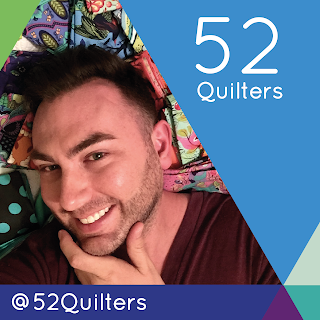 I am beyond excited to be hosting this month on 52 Quilters with a Fussy Cutting theme. 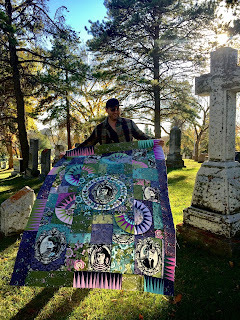 I began sewing and quilting just over 2 years ago, and since that time, quilting has definitely become my passion. I just finished my 23rd quilt, and will be going on a quilting cruise in just a few short weeks! I work full-time and also enjoy spending time with my hubby and son, both of whom understand my addiction to quilting. 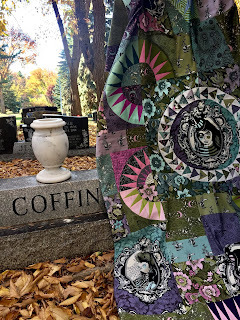 I try to find time to sew or plan quilting projects every day. I became inspired to give Fussy Cutting a try after seeing the work of fellow quilters on Instagram. It adds an appealing visual element to a quilt block, sort of an "I Spy" feel (Anyone remember those books from the 90s?). I make use of two types of Fussy Cutting, focal and splicing. Both are great ways to highlight unique and beautiful fabrics in your quilts! After some trial and error, patience, seam ripping, and making use of templates, I've created some very eye-catching blocks. My goal is for you all to give fussy cutting a try (if you haven't already), and to continue inspiring the amazing online quilting community that motivates me every single day!